No, not me. I don’t care much about my own market share, in case you haven’t noticed. It’s Sony. 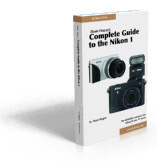 They’ve once again launched a press release claiming being “first” at something, this time full frame interchangeable lens camera volume and dollar volume in the United States for the first six months of 2018. Sorry for the very specific qualifiers, but this is how the statistics-into-press-release game is played. Thing is, because the data is protected by NDA, I can’t really talk about or show the numbers, and it would really help to be able to be specific. 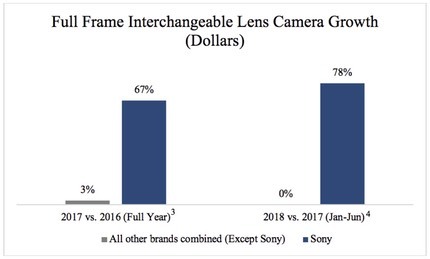 It’s an ephemeral victory, if we can call it that, as Sony’s numbers are helped by being the only one to introduce a new full frame interchangeable lens camera in the period claimed, and you can’t generally get a meaningful long-term read off long-term sales in the first few months of a new camera introduction. Meanwhile, Nikon’s D850 is still sales limited by how many NIkonUSA imports each month. Basically it’s a sold out camera whose upper end of sales volume is not known. And it’s more than holding it’s own against each of the Mark III A7 models. That chart looks really impressive, but if you read it correctly, it’s actually an indictment of where Sony was in 2016. What drove the 2017 and 2018 increases? The new A7Rm3, A9, and A7m3 models that were introduced. All higher priced cameras (the m2 models by that point were often highly discounted). In that same period, Canon introduced the EOS 6Dm2, and Nikon the D850. In other words, Sony introduced three high priced models in the time period, Nikon one, and Canon introduced at the lower end of the spectrum (basically at the A7m3 price). Cameras such as the Nikon D610 and D750 were quite old during the measured period; I’d submit that most people that want one already have one. *Yeah, Sony’s footnotes need footnotes. The above chart is based upon dollars. And that includes kit lenses, if included in the sale. Canon and Nikon already had a large number of full frame users prior to this period, so more of their sales were body only than Sony’s, which distorts the dollar numbers. Don’t get me wrong: Sony managed to do something that nobody really thought was possible (reach Canon/Nikon level of full frame sales). They should be proud of that and promote the accomplishment, as they’ve done. But you’ll note that the pie charts above—which use the same numbers—don’t look quite as dramatic as Sony’s ;~). Those of us who analyze the camera market generally look at longer-term patterns than the two year pattern Sony is pointing to. Why? Because new model introductions distort the overall picture, certainly for the six month period around the launch(es). Sony had a launch in the first half of 2018 while neither Canon nor Nikon did, and Nikon’s best selling full frame camera is still not being brought into the US market at the level of demand (e.g. it is still sold out nearly a year after being introduced). Sony’s press release is carefully timed. Nikon is next to launch cameras in this category, and it should distort the numbers considerably in a different direction for the second half of the year. In fact, my prediction is that this will distort the numbers about as far as Nikon can manage to distort them in terms of shipping products (that’s a veiled way of saying that I believe we’re going to similar issues with their new full frame mirrorless system as they have with the D850: it will be out of stock due to demand exceeding supply). Yes and no. No in the sense that all the cameras we’re talking about are fairly low in overall production numbers, typically near the 10k/month mark best case. But because of their high prices, they pull a lot of dollars. And because they’re high end cameras they pull a lot of Internet discussion about performance and features, and which one is “the winner." Be thankful we live in a time when we’ve got plenty of choices, and very good ones, at that. We haven’t had such a hotly contested three way competitive race in ILC since Minolta introduced autofocus back in the film SLR era. If you don’t remember that period, that was also a time when Canon and Nikon ratcheted up their development to match an upstart. Competition is good for all users. Let’s just welcome it and not get too hung up on who’s number one, two, and three, as it’s almost certainly going to bounce around as new cameras are introduced.